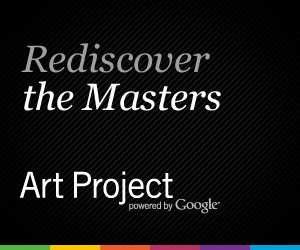 The Munch Museum cooperates with Google in the digital art presentation called the Google Art Project. Now you can watch several of Edvard Munch’s works from The Munch Museum collection online. Here the public is invited to visit an enourmous selection of art works from all over the world, and have unique opportunities to learn more about single artists and art collections. 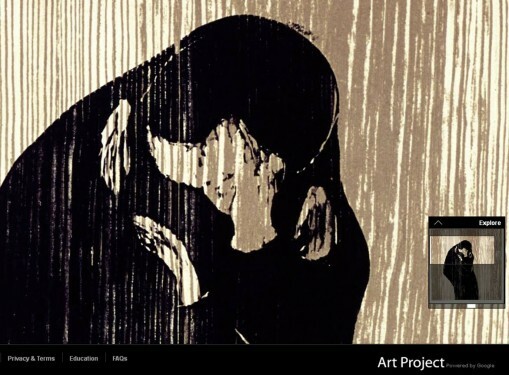 Google Art Project is like a gigantic digital exhibition. At Google Art Project/The Munch Museum people worldwide now have access to 53 of Edvard Munch’s main works of art, including The Scream. Read more about our cooperation here. The Munch Museum wanted to offer Munch enthusiasts who are not able to visit our museum in Oslo, an interactive Gallery. 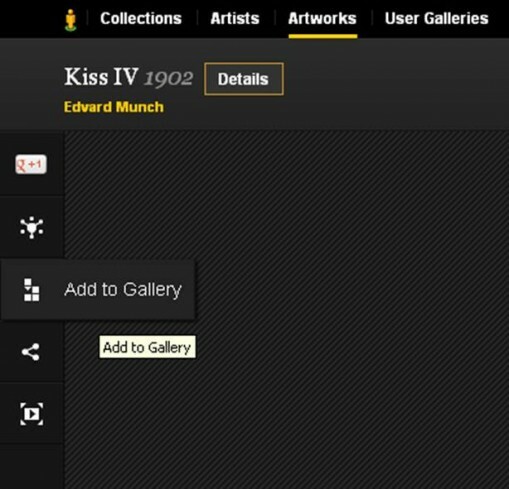 Now you can create your own “exhibitions” of Edvard Munch’s art, and as a bonus put them together with works by other artists. Edvard Munch, “Kiss IV”, 1902 is one of the art works currently exhibited in “Puberty. Summer Exhibition 2012″ at the Munch Museum. Click for details to find more information. 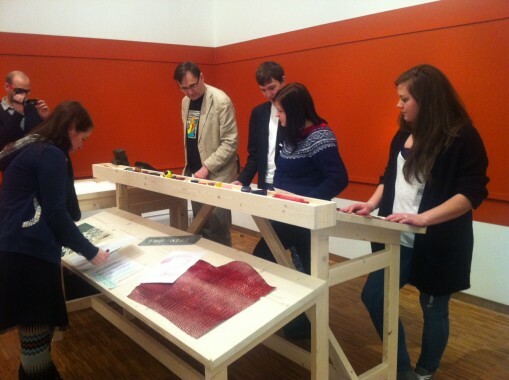 Explore the woodcut and see the lines of the material at close range – even closer than in real life. 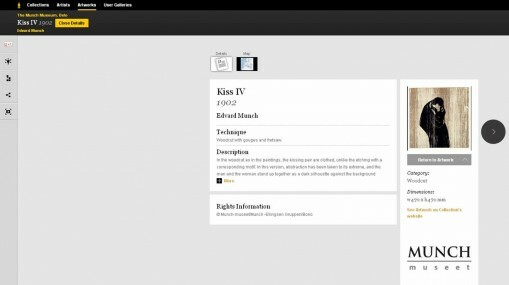 Add to Gallery to create your own exhibition. 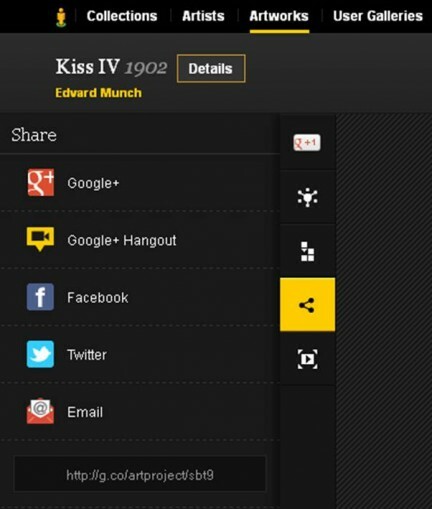 Of course you can share your favorites with friends. Test it out yourself and enjoy! We are very pleased if you like to share your experience with us on Facebook, Twitter/@themunchmuseum or here. 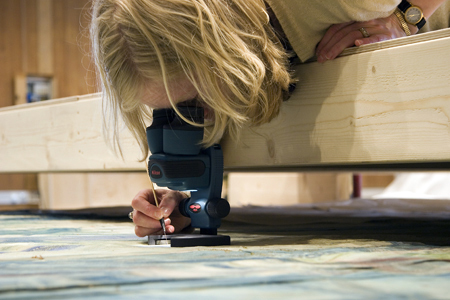 The Conservation Project “Paintings on Rolls” started in March 2006 at the Munch Museum. 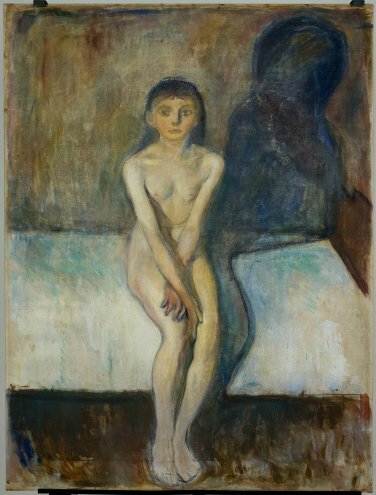 The project encompassed 31 sketches that Munch painted in connection with the decorations for the University Aula in Oslo, during the period 1909–1916. In addition, the project included 15 other drafts from the period 1909-1930 stored on rolls – including eight of which were painted for the first submitted proposal for the Aula decorations in 1910, The Human Mountain. However, this work was rejected by the jury (Pettersen 2008: 846). 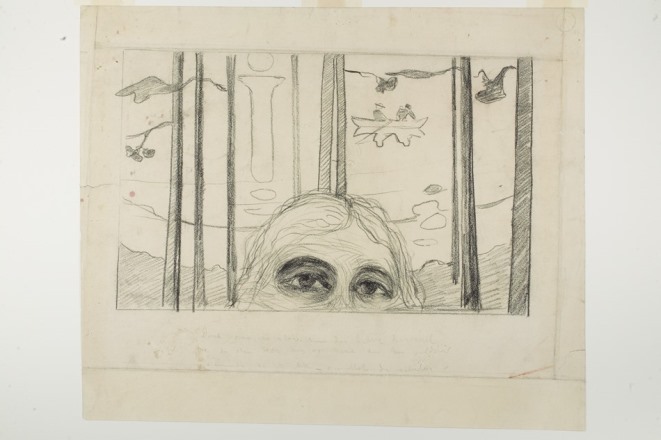 Among the other seven sketches, there were three that Munch worked on as a proposal for the decoration of the Town Hall in Oslo, which he never completed, while the last four drafts have other motifs. The drafts measure from 142 cm X 130 cm to 450 cm X 1140 cm. The sketches are working drafts and were probably never intended to be mounted on stretchers. Many of the them were stored on rolls during Munch’s own lifetime, and were kept like this after his death as well. As many as six canvases were stacked on the same roll with the paint layers facing inward. The diameters of the rolls measured from 6 cm to 30 cm. With a few exceptions the rolls were placed directly on shelves in the Munch Museum’s storage rooms. The aim of the present conservation project has first and foremost been to improve the storage conditions. Unlike the smaller sketches that could be stored flat in boxes, the largest canvases still had to be stored on rolls. However, the new rolls have larger diameters. In addition, we have used proper packing material, and the rolling method has been improved: the sketches have been rolled with the paint layers facing outward, we have used one roll for each single draft, and a hanging system has been constructed which allows the rolls to be suspended on poles. With the exception of five sketches, the works had not previously been examined. The existing information proved to be very limited, so documentation regarding the materials and the condition of the sketches was therefore an important aspect. During the course of the project we have discovered new phenomena of Munch’s art and gained new knowledge about his painting technique, materials and methods. The Munch Museum has now completed the documentation and treatment of 46 drafts, approximately 400 m2 of painted surfaces. More than 18 conservators have been involved in the project which has been an extraordinary one and has offered several unusual challenges that have required a major collaboration between technicians and conservators. The enormous unstretched formats, for instance, had to be treated while lying horizontally. For this, various bridging systems were constructed in order for the conservators to treat the mid sections of the sketches. 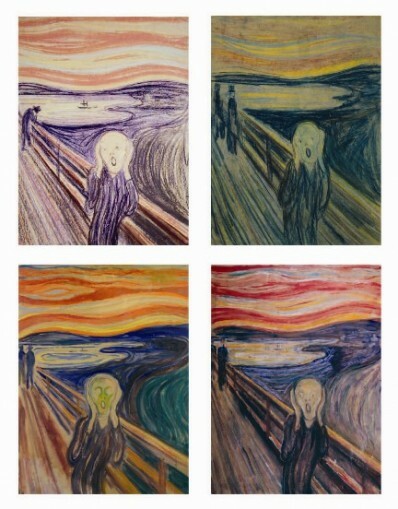 Owing to Munch’s choice of materials and to the fact that he both painted and kept many of this drafts out of doors, their condition is extremely frail. 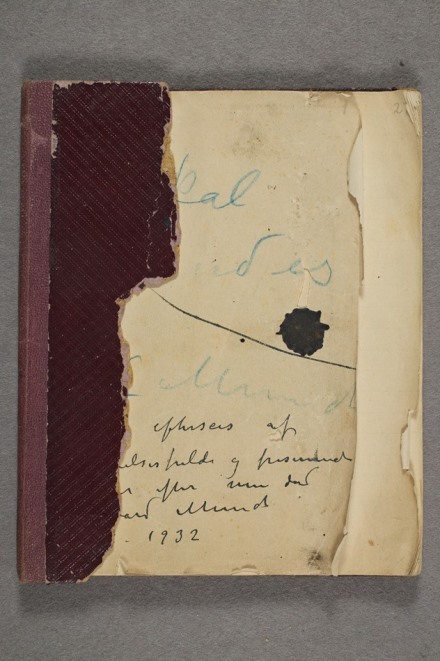 Given these special circumstances, it was not practical to employ traditional methods of conservation treatment. In addition, the aim to use a minimum of invasive methods was a challenging and instructive one. Through his life, Edvard Munch painted several self portraits. Currently, Schirn Kunsthalle in Frankfurt is exhibiting Edvard Munch’s “Self-Portrait on the Glass Veranda”, 1930-33 (MM M 446). 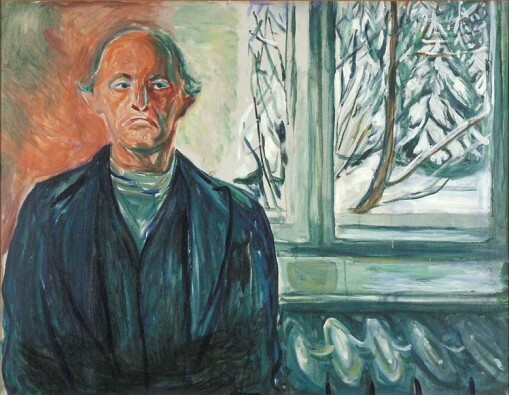 At the same time, the Munch Museum in Oslo shows two similar paintings made during the same period of Munch’s life at Ekely, nearby Oslo, MM M 242 and MM M 245. The latter is concieved in a combination of oil and crayon on wooden panel. If we compare the versions shown here, the differences are visually obvious. 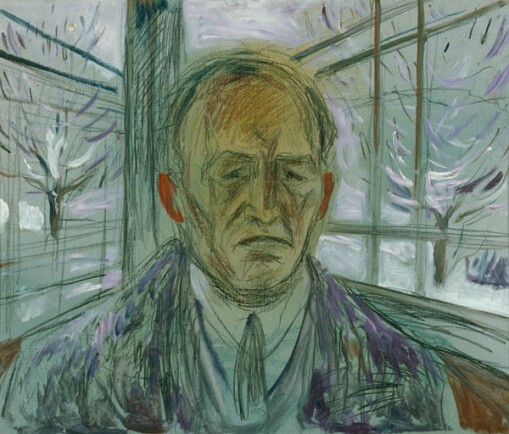 In the catalogue to the winter exhibition “Sense of snow”, Curator Petra Pettersen describes the works (MM M 242 and MM M 245) in the following lines: “Two self-portraits of the aging artist on the glass veranda are executed as though Munch is taking pictures of himself from different distances.” (p.51) Again, an example of Munch’s modern eye? Curators Magne Bruteig and Ute Kuhlemann-Falck from the Munch Museum presents Edvard Munch’s use of rubbings – which are neither drawings nor prints, but historically pre-dates all other printing techniques. The occasion was an exclusive preview during the hanging period of the exhibition. The exhibition is now opened: “Neither print – nor drawing: the rubbings of Edvard Munch” 20 Jan – 28 May 2012. 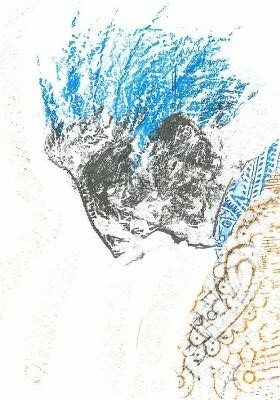 Most people are familiar with the very concept of rubbing images onto paper, for example, with tracing details of a coin by first covering it with a sheet of paper and then let the pencil run over it. In the exhibition “Neither print – nor drawing: the rubbings of Edvard Munch”, the audience is invited to experiment with the technique of frottage. On this occasion, the Munch Museum launches a competition where we will pick a weekly winner. The “Frottage of the week” will be presented on one of the walls in the last exhibition-hall and on the museum’s website. The winner may choose between a range of exciting prizes from the museum shop. The exhibition goes on until 28 May 2012, and at the end of the exhibition period, three main winners will be chosen. More about the competition here.